David Robert Jones (8 January 1947 – 10 January 2016), known professionally by his stage name David Bowie, was an English rock musician and actor. Bowie was born in Brixton, London. He grew up in Bromley, Kent. He played the saxophone. He was a singer in London blues bands. He used the alias David Bowie because David Jones sounded too much like Davy Jones (of The Monkees). He took the name Bowie from Jim Bowie, who invented the Bowie knife. Bowie became known to the public with the 1969 song "Space Oddity". This single was released when man first landed on the moon. The song is based on the movie 2001: A Space Odyssey by Stanley Kubrick. In 1970, Bowie won an Ivor Novello Award for "Space Oddity". Bowie's album The Rise and Fall of Ziggy Stardust and the Spiders from Mars was released in 1972. It is one of his best-known albums. As a result of his performance, Bowie became a leader of glam rock. Ziggy Stardust became Bowie's second personality (alter ego). For a press conference, he would show up as Ziggy. Bowie let Ziggy Stardust come to an end during a live concert in the Hammersmith Odeon theatre on 3 July 1973. In 1983, this show was released as movie and soundtrack (Ziggy Stardust – The Motion Picture). Bowie also produced Lou Reed's "Transformer". He released "Aladdin Sane" (his first number one album in the United Kingdom). In 1974, after releasing "Diamond Dogs", Bowie settled in Los Angeles. He experimented with drugs, especially cocaine. In 1975, "Fame" (from the Young Americans album) a song co-written with John Lennon, was number 1 on the United States charts. Bowie played an alien in the movie The Man Who Fell To Earth. A new second personality was The Thin White Duke. This was introduced on the Station to Station album in 1976. The song "Golden Years" scored high in the pop charts. In 2003, the album was ranked number 323 on Rolling Stone magazine's list of the 500 greatest albums of all time. After releasing Station to Station, Bowie moved to Berlin. He was interested in German music. He wanted to end his drug abuse. In Berlin, he started to work with producer Tony Visconti and with Brian Eno, the "king of oblique strategies". Bowie was a producer for Iggy Pop too. The Berlin Trilogy Albums are Low (1977), Heroes (1977) and Lodger (1979). Bowie left Berlin in 1980. The last album at that time was Scary Monsters... And Super Creeps, featuring the United Kingdom number 1 single "Ashes To Ashes". In 1981, he had a big hit with "Under Pressure", together with Queen: it peaked at number 1 on United Kingdom charts. In 1983, Bowie released Let's Dance, his biggest selling album. The title track peaked at number 1 on both sides of the Atlantic. In 1984, Bowie won a Brit Award as Best Male Artist. In 1985, he won a Grammy Award for Best Video (Short Form). Yet in 1985, David Bowie and Mick Jagger released the charity single "Dancing In The Street". In 1986, Bowie released the hit-single "Absolute Beginners". In 1989, Bowie formed the band Tin Machine. This was his first real band since the 1970s. With this band, Bowie recorded three albums: Tin Machine (1989), Tin Machine II (1991) and Oy Vey, Baby (1992). By the 1990s, Bowie had become more interested in soul, jazz and hip hop. This was first noticed on the album Black Tie, White Noise. 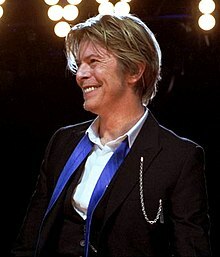 Bowie was inducted into the Rock and Roll Hall of Fame on 17 January 1996. In 2013, after a ten years hiatus, Bowie released his twenty-fourth album, The Next Day. In 2014, he was nominated for Best Rock Album at the Grammy Awards  and won a Brit Award for Best Male Artist. His last album, Blackstar, was released on 8 January 2016. That was his 69th birthday and two days before his death. After Bowie's death, Blackstar reached number one in the United Kingdom. It was the only Bowie album to peak at number one in the United States. In 2017 "Blackstar" won 5 Grammy Awards. "Blackstar" also won a Brit Award for the Best Album and David Bowie also won a Brit Award for Best Male Artist. Bowie married Mary Angela Barnett in 1970. Their son, Duncan Jones was born in 1971. The couple divorced in 1980. Bowie married Iman in 1992. The couple's daughter, Alexandria Jones, was born in 2000. On 10 January 2016, Bowie died after an 18-month battle with liver cancer in Manhattan, New York City. He was 69 years old. His remains were later cremated on 14 January in a private ceremony in New York. Bowie covered many genres including art rock, hard rock, glam rock, alternative rock, krautrock, protopunk, post-punk, electronica, Blue-eyed soul, New Wave, Industrial, Techno, Jazz, Dance music, Funk, Disco, Experimental rock, Folk, Instrumental, Ambient and house. ↑ "David Bowie: Rock and Roll Hall of Fame Induction". Rock and Roll Hall of Fame. Retrieved 21 January 2016. ↑ "Grammy nominations 2014: David Bowie among Robin Thicke and Jay-Z". Telegraph.co.uk. 7 December 2013. Retrieved 21 January 2016. ↑ Griggs, Brandon. "David Bowie's haunting final album hints at death". CNN. Retrieved 21 January 2016. ↑ "David Bowie's last release, Lazarus, was 'parting gift' for fans in carefully planned finale". The Daily Telegraph. 11 January 2016. Retrieved 21 January 2016. ↑ Barnes, Mike (10 January 2015). "Legendary Artist David Bowie Dies at 69". The Hollywood Reporter. Retrieved 10 January 2015. This page was last changed on 18 July 2018, at 01:09.